It’s been a rough couple of weeks for Trump. Last Thursday, the international community expressed its anger with the United States for dropping out of the Paris Accords, increasing economic sanctions, and, most importantly, dropping the "Iran deal." When Trump was put on the spot in front of the United Nations assembly, the crowd erupted into laughter when he attempted to gloat over the success of his leadership. 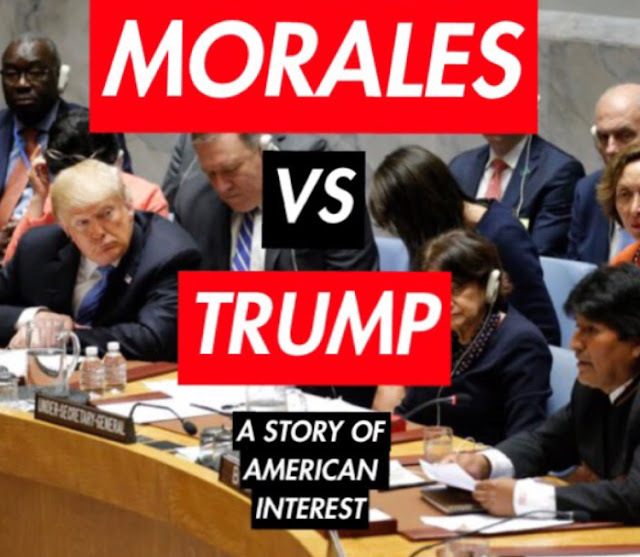 The next day, at a UN security council meeting, Bolivian president Evo Morales spared no expense in vocalizing his abhorrence with President Trump and US foreign policy. This is probably the first time an international leader has taunted and criticized Trump directly to his face, sitting just across from him. Having an temporary seat on the council, Morales used the opportunity to revisit the history of foreign policy of the United Stated in Latin America, stating “I would like to say to you that in no way is the United States interested in upholding democracy, if such were the case, it would not have financed coup d’etats and supported dictators’’. Morales referred to multiple events in this very powerful statement, but perhaps more specifically to the instance in 1973 when President Nixon financed a fascist military coup to depose the democratically elected Chilean President Salvador Allende, an act still seen as unforgivable in the eyes of many Chileans. He used this example because this event is very relevant to his home country, happening only a shared border away. He also may have used this statement to draw a parallels to the subject at hand, the proposed cooperation of the international community against Iran for its alleged “nuclear activity”. Twenty years before the coup d’etat in Chile in 1953, the United States helped install another dictator, the Shah of Iran. Just as in the case of Chile, the United States admittedly dissolved a democratically elected government in favor of a Pro-American dictator. This lead to the Iranian Revolution in 1979 where opponents of the Shah from both the left and the right successfully ousted him. In the aftermath of the Shahs ousting, the Sunni Muslim affiliated Islamic Republic came to prominence and suppressed all other political factions. This chain reaction of the suppression of democracy was initiated by the United States, and, despite all of this, the United States continues to act on the offensive regarding foreign policy towards Iran without ever acknowledging or apologizing for its Imperialist acts. On July 15th Obama’s “Iran deal” was signed by the International community saying that Iran must give up 97% of its enriched Uranium supply, only leaving 3% for the Iranians--making it impossible for them to make a nuclear weapon. Iran was fine with this, given it had denied making nuclear weapons in the first place! All this background and context bring us to the present moment in which Trump, without any verifiable evidence or support from the international community, has decided to accuse Iran yet again of making weapons of mass destruction. Thus begins another self-contradicting action by an American administration whose only interest seems to be justifying its passed acts of imperial aggression. Another tragic case of cognitive dissonance. The biggest thing that anyone should take from this information is that the United States has toppled democratically elected governments, installed dictatorships, admits to doing so, and to this day denies or refuses to acknowledge that these acts were wrong and still uses its political leverage to exploit these countries however it sees fit.